Make unattainable goals feel realistic. Make order out of chaos. Do you want a transformation to occur in your life but don’t know where to begin? Do you want to develop your spiritual practices through the power of ritual, art and writing, but need help defining structure to help you reach your creative goals? I'm excited to introduce a beta-launch collaborative creative program, called The Mint Passage, which is an individualized mentorship program developed to help you forge a clear path forward, from chaos into order, no matter what kind of changes you want to make in your life. A new program with limited slots available each month! Custom Altar Artwork to help you define space to practice making changes; artwork created by me and defined by your unique Mint Passage transformation! After a metaphysical assessment, you have the option to sign up for additional 1:1 creative, supportive guidance with me, or less-intimate, traditional guidance through project management structure and altar development. Together, we’ll look at the type of transformation you want to make, and develop goals and an action plan to help you practice being your new self. Gain a clear picture of the past by taking a look at your natal chart, in Eastern + Western perspectives, to gauge how space and seasons might be affecting your present. Develop perspective for where you've been, who you are, where you are currently, and decide where and who you want to be going forward. Fill out an Afrescmint Analysis form to gain more understanding of your metaphysical circumstances. Curious to know what the Afrescmint Analysis is like? Download a FREE Sample Afrescmint Analysis below. Thank you for your interest in The Mint Passage! Please click here to download your FREE Sample Afrescmint Analysis PDF. I’m a sacred visionary artist, which means I tap into meditative states to create original works. 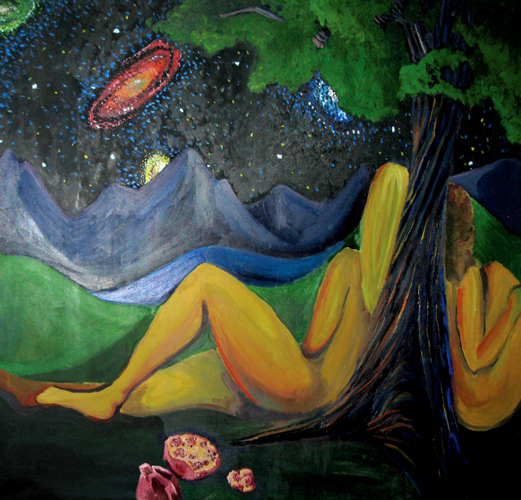 My paintings, illustrations and murals are spiritually or divinely-inspired from personal or mythical stories. Playful art sets the stage for divine expression and creates space to help us heal from long days and tiring nights: I believe deeply in the healing, restorative power of art. I create magical moments in order to rest. Peaceful spaces help to acknowledge the presence of pain. What is the creative spark your inner God, Goddess or Buddha needs to grow, and flourish? In a world full of legitimate fear, it’s more important than ever to create safe spaces in order to honor your sacred individuality. Creating sacred spaces to honor individuality allows you to find and listen to your truths, and embrace the divinity that only you can bring to the world by being your core self in safety, light and joy. I intend to send your follow-up email with your assessment results as soon as I can (usually within 1 week).